View of Glamis Castle in Scotland. The castle, which was originally a hunting lodge, has been owned by the Earls of Strathmore and Kinghorne since the 14th century, to which period the original keep is dated. 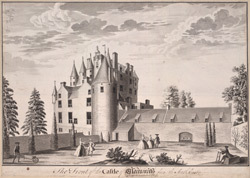 The castle has been altered many times and with the Bartizans (battlemented parapets), over hanging turrets, cone shaped roofs and crenulations, it now has the appearance of a grand chateaux. The castle is the setting of Shakespeare’s play Macbeth and it was the childhood home of the late Queen Elizabeth, the Queen Mother.